Maternal smoking results in an increase in the incidence of complications such as spontaneous abortion, placental abruption, preterm delivery, intrauterine growth restriction, and stillbirth. There are few studies in the literature about smoking-related oxidative stress in pregnant women and this relationship is not clear. The aim of our study was to determine the relationship between oxidative stress and smoking in pregnancy by measuring oxidative stress indicators such as malondialdehyde and protein carbonyl and total antioxidant status in cord blood and to raise awareness about the public health measures that can be taken in this regard. A total of 56 pregnant women (24 pregnant smokers and 32 pregnant non-smokers) were included in the study. 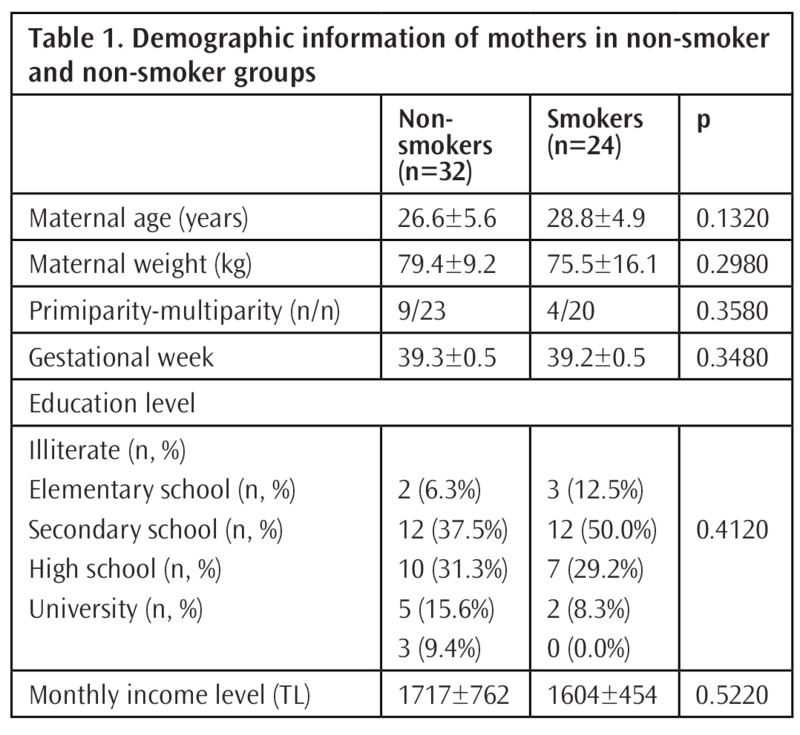 Pregnant women were divided into two groups as smokers (n=24) and non-smokers (n=32). Then, smokers were divided into 3 groups according to their smoking frequency. Malondialdehyde, protein carbonyl and total antioxidant status levels in cord blood were compared between these groups. There was no statistically significant difference between groups in terms of malondialdehyde, protein carbonyl levels and total antioxidant capacity (p>0.05). In addition, no statistically significant difference was found between smoking subgroups (p>0.05). The potential of smoking to produce oxidative stress in the fetus is not clear enough due to the contradictory findings of clinical trials. Our findings make it difficult to establish a relationship between maternal smoking and oxidative stress. The subject should be illuminated by further clinical studies evaluating different oxidants and antioxidant molecules. Oxidative stress shows the serious imbalance between free radical formation and antioxidant defense mechanism. Uncontrolled increased free radicals lead to oxidation of biomolecules such as nucleic acid, protein and lipid, alteration of genetic information, deterioration of protein structure, inhibition of enzyme activity and damage to cell membrane, thus leading to dysfunction of cells, tissues and organs. As a result, many diseases such as cancer and cardiovascular diseases can develop (1, 2). Smoking exacerbates the production of free radicals and increases the oxidative stress significantly in vivo (3). Maternal smoking is the most important modifiable factor associated with adverse pregnancy outcomes (4, 5). Epidemiological studies have reported that 20-30% of pregnant women smoke (6, 7). Thus, significant metabolic and biochemical changes and adaptive responses are observed in both the mother and the fetus, and there is an increase in the incidence of complications such as spontaneous abortion, placental abruption, preterm delivery, intrauterine growth restriction and stillbirth (8, 9). In the literature, there are few studies about smoking-related oxidative stress in pregnant women and this relationship is not clear (10, 11). The aim of our study was to determine the relationship between oxidative stress and smoking in pregnancy by measuring oxidative stress indicators such as malondialdehyde and protein carbonyl and total antioxidant status in cord blood and to raise awareness about the public health measures that can be taken in this regard. A total of 56 healthy pregnant women, who were between 20-35 years of age and who gave birth at our hospital, were included in the study. Pregnant women were divided into two groups as smokers (n=24) and non-smokers (n=32). Then, smokers were divided into 3 groups according to their smoking frequency. During their pregnancy, pregnant women in group I had <5 cigarettes a day, group II had 6-10 cigarettes a day and pregnant women in group III had >10 cigarettes a day. Detailed medical histories were obtained and following data were recorded into the case report form: maternal birth year, age, weight, occupation, economic status, presence of gestational diabetes mellitus, number of pregnancies, history of chronic disease, alcohol intake, follow-up status, primiparity-multiparity, drugs used, smoking, fetal birth weight, type of delivery, gender and gestational week of the infant. Patients with gestational diabetes mellitus, maternal or fetal history of a genetic or chronic disease, and patients with alcohol intake were excluded from the study. The umbilical cord blood was collected into blood tubes. Following 20 minutes of coagulation, the blood was centrifuged and stored at -80 degrees in freezer until studied. Then, sera were studied for malondialdehyde (MDA), which is the end product of lipid peroxidation, and protein carbonyl, which is a product of protein oxidation, and for total antioxidant status (TAS), which demonstrates the antioxidant status. MDA levels were determined by the ELISA method (Uscn Life Science Inc. Wuhan, China). The analytical measuring range is 24.6-2000 ng/mL. Protein carbonyl levels were determined by colorimetric kit (Cayman Chemical, USA). The analytical measurement range of the assay is 1-100 nmol/mL. TAS levels were determined by colorimetric kit (Randox, Lot 362601, UK). The analytical measuring range is 1.3-1.77 mmol/L. The study was approved by the ethics committee of our hospital with the letter dated 23.02.2016 and numbered 430. Our study was conducted in accordance with the principles of the Helsinki Declaration and we obtained informed consent from all pregnant women who participated in the study. Statistical analysis was performed with MedCalc (MedCalc Software, Broekstraat, Mariakerke, Belgium) program. Normality of continuous variables was investigated by Kolmogorov-Smirnov test. Variables with Gaussian distribution were expressed as mean ± SD and variables with non-Gaussian distribution as median (interquartile range). Student’s t-test was used to compare the variables with normal distribution. Chi-square test was used to compare the group ratios. Correlations between variables were analyzed by Spearman’s correlation coefficient (rs) or Pearson’s correlation coefficient (r). Statistical significance was assessed at p<0.05. The mean age, maternal weight, gestational week, and parental monthly income levels were not significantly different between the two groups. The educational status profiles and primiparity-multiparity were similar in both groups (Table 1). The birth weights, genders, and mean MDA, protein carbonyl and TAS values in cord blood were not statistically different between the two groups (Table 2). No statistically significant difference was found between smoking sub-groups (Table 3). Spearman and Pearson correlation analyzes for each of the two groups showed a poor negative correlation between MDA levels and infant weight in the smoker group among maternal and fetal variables (r=-0.428; p=0.037). Increased oxidative stress in smokers can be explained either by increased free radical production or by deteriorated antioxidant defense system due to direct exposure to smoke (12). In a single breath, a smoker exposes more than 1015 free radicals (13). When compared to non-smokers, it has been reported that glutathione peroxidase and superoxide dismutase antioxidant enzyme levels are significantly low in smokers (14, 15) and oxidative stress markers (MDA levels) are higher in smokers (15, 16) during resting. Even similar dietary consumption (total calories, protein, carbohydrate, fat, vitamin E, vitamin C, and some minerals) did not change these results (12). It has been reported that young and smoker individuals have low plasma antioxidant capacity and high lipid peroxidation level compared to non-smokers and it is emphasized that the most contributing factor to negative changes is the number of smoking years (12). In another study, there was a moderate negative correlation between the number of cigarette packs consumed annually and the level of lipid peroxidation (17). In addition, it was found that DNA damage was significantly higher in young, healthy, male smokers compared to non-smoking control group and the level of reduced glutathione, which is a strong component of the cellular antioxidant defense system, was found to be low (18). In our study, MDA and protein carbonyl levels and TAS levels were measured in cord blood in order to determine the oxidative stress status in pregnant women. The levels of MDA, protein carbonyl and TAS were not statistically different between smokers and non-smokers, and between smoking subgroups. Ermiş et al. (19) did not find significantly different MDA and superoxide dismutase enzyme levels in smokers and their infants compared to non-smokers and passive smokers, but glutathione peroxidase antioxidant enzyme levels were found to be significantly higher in smokers and their infants. This information suggests that antioxidant activity increases for the purpose of compensation in smoking. The MDA results in the study by Ermiş et al. (19) were similar to MDA results in our study. Some researchers reported that serum levels of superoxide dismutase and glutathione peroxidase were higher in non-smokers than in smokers (20, 21). Bolisetty et al. (22) reported that an increase in oxidative stress in the smokers group resulted in lower vitamin E levels. Chelchowska et al. (11) reported high malondialdehyde and low total antioxidant capacity levels in cord blood of smoker pregnant women. However, in this study, they reported low total antioxidant capacity levels by measuring the total radical capture parameters (TRAP) levels instead of TAS. Fayol et al. (23), on the other hand, reported high TRAP levels in passive smokers compared to non-smokers, while there was no difference in active smokers. In contrast to this information, we did not find significantly different TAS levels between the groups. Olympio Rua et al. (10) reported that the levels of reactive oxygen species and advanced oxidation protein products increased in cord blood of smoker pregnant women. In our study, we found that protein carbonyl levels were not statistically different between the groups. To determine protein oxidation, the formation of protein carbonyl, nitrotyrosine and advanced protein oxidation products or the loss of thiol groups can be used (24, 25). The antioxidant molecules are exogenous and endogenous structures, which neutralize the damage caused by the oxidant molecules by both intracellular and extracellular defense. While extracellular defense includes a variety of molecules such as albumin, bilirubin, transferrin, ceruloplasmin and uric acid, intracellular free radical collecting enzymes provide the main antioxidant defense. These enzymes are superoxide dismutase, catalase, glutathione-S-transferase, glutathione peroxidase, glutathione reductase and cytochrome oxidase (26). As there is an oxidant-antioxidant balance in the body, the organism is not affected from free radicals as long as the oxidative balance is achieved. Therefore, the changes in the tests we measured in our study may be maintained at normal levels with a compensatory effect, and this may be the reason why we could not find any different results between the groups. Smoking may cause significant changes in the levels of other oxidant and antioxidant molecules that we did not measure in our study. It is stated that it is difficult to explain the oxidative stress with a single marker (27, 28), and that it is necessary to use more than one marker to show the presence of oxidative stress (28). Therefore, it is clear that further studies are needed to measure other oxidant and antioxidant tests. In our study, we also examined the socio-economic status of pregnant women. We did not find any differences between the smoker and non-smoker groups in terms of educational status and income level. The potential of oxidative stress to produce oxidative stress in the fetus is not clear enough due to the contradictory findings of clinical studies. Our findings make it difficult to establish a relationship between maternal smoking and oxidative stress. The subject should be illuminated by further clinical studies evaluating different oxidants and antioxidant molecules. Ethics Committee Approval: The study was approved by the İstanbul Okmeydanı Training and Research Hospital Ethics Committee (Approval no: 2016/430). Informed Consent: Obtained informed consent from all pregnant women who participated in the study. Surgical and Medical Practices: H.D., O.D., Concept: H.D., O.D., Design: H.D., O.D., Data Collection or Processing: H.D., O.D., Analysis or Interpretation: H.D., O.D., Literature Search: H.D., O.D., Writing: H.D., O.D. Conflict of Interest: The authors have no conflicts of interest to declared. Kelly G. The interaction of cigarette smokers and antioxidants. Altern Med Rev 2003;8:43-54. Tonini CL, Campagnaro BP, Louro LP, Pereira TM, Vasquez EC, Meyrelles SS. Effects of aging and hypercholesterolemia on oxidative stress and DNA damage in bone marrow mononuclear cells in apolipoprotein E-deficient mice. Int J Mol Sci 2013;14:3325-3342. Alberg AJ. The influence of cigarette smoking on circulating concentrations of antioxidant micronutrients. Toxicology 2002;180:121-37. Urato AC, Peter I, Canick J, Lambert-Messerlian G, Pulkkinen A, Knight G, et al. Smokers in pregnancy is associated with increased total maternal serum cell-free DNA levels. Prenat Diagn 2008;28:186-90. Votavova H, Dostalova Merkerova M, Krejcik Z, Fejglova K, Vasikova A, et al. Deregulation of gene expression induced by environmental tobacco smoke exposure in pregnancy. Nicotine Tob Res 2012;14:1073-82. World Health Organization: WHO report on the global tobacco epidemic. Implementing smoke-free environments. WHO 2009. Kareli DE, Pouliliou SE, Nikas IH, Psillaki AN, Galazios GC, Liberis VA, et al. Cytogenetic evaluation of pre-pregnancy smokers in maternal and newborn lymphocytes. Eur J Obstet Gynecol Reprod Biol 2012;165:205-9. Andres RL, Day MC. Perinatal complications associated with maternal tobacco use. Semin Neonatol 2000;5:231-41. Gallo C, Renzi P, Loizzo S, Loizzo A, Piacente S, Festa M, et al. Potential therapeutic effects of vitamin e and C on placental oxidative stress induced by nicotine: an in vitro evidence. Open Biochem J 2010;4:77-82. Olympio Rua EA, Porto ML, Ramos JP, Nogueira BV, Meyrelles SS, Vasquez EC, et al. Effects of tobacco smoking during pregnancy on oxidative stress in the umbilical cord and mononuclear blood cells of neonates. J Biomed Sci 2014;21:105. Chelchowska M, Ambroszkiewicz J, Gajewska J, Laskowska-Klita T, Leibschang J. The effect of tobacco smoking during pregnancy on plasma oxidant and antioxidant status in mother and newborn. Eur J Obstet Gynecol Reprod Biol 2011;55:132-6. Bloomer RJ. Decreased blood antioxidant capacity and increased lipid peroxidation in young cigarette smokers compared to nonsmokers: Impact of dietary intake. Nutr J 2007;6:39. Pryor WA, Stone K. Oxidants in cigarette smoke. Radicals, hydrogen peroxide, peroxynitrate, and peroxynitrite. Ann N Y Acad Sci 1993;686:12-27. Ho SP, Chan-yeung M, Chow KKM, Ip MSM, Mak JCW. Antioxidant enzyme activities in healthy Chinese adults: influence of age, gender and smoking. Respiratory 2005;10:305-9. Özbay B, Dülger H. Lipid peroxidation and antioxidant enzymes in Turkish population: Relation to age, gender, exercise and smoking. Tohoku J Exp Med 2002;197:119-24. Covas MI, Elosua R, Fıto M. Relationship between physical activity and oxidative stres biomarkers in women. Med Sci Sports Exerc 2002;34:814-9. Çimen F, Ulubaş B, Eryılmaz T. Sigara içenlerde lipid peroksidasyonu, antioksidan aktivite ve solunum fonksiyon testleri [Lipid peroxidation, antioxidant activity and pulmonary function test in smokers]. Turkiye Klinikleri J Med Sci 2002;22:292-6. Dinçer Y, Saygılı Eİ, Akçay T. Sigaranın DNA hasarı ve kan glutatyon düzeyi üzerine etkisi [ınfluence of smoking on DNA damage and blood glutatyon level]. Turkiye Klinikleri J Med Sci 2003;23:108-11. Ermis B, Ors R, Yildirim A, Tastekin A, Kardas F, Akcay F. Influence of Smoking on Maternal and Neonatal Serum Malondialdehyde, Superoxide Dismutase, and Glutathione Peroxidase Levels. Ann Clin Lab Sci 2004;34:405-9. Hulea SA, Olinescu R, Nita S, Crocnan D, Kummerow FA. Cigarette smoking causes biochemical changes in blood that are suggestive of oxidative stress: a case-control study. J Environ Pathol Toxicol Oncol 1995;14:173-80. Kim SH, Kim JS, Shin HS, Keen CL. Influence of smoking on markers of oxidative stress and serum mineral concentrations in teenage girls in Korea. Nutrition 2003;19:240-3. Bolisetty S, Naidoo D, Lui K, Koh TH, Watson D, Montgomery R, et al. Postnatal changes in maternal and neonatal plasma antioxidant vitamins and the influence of smoking. Arch Dis Child Fetal Neonatal 2002;86:36-40. 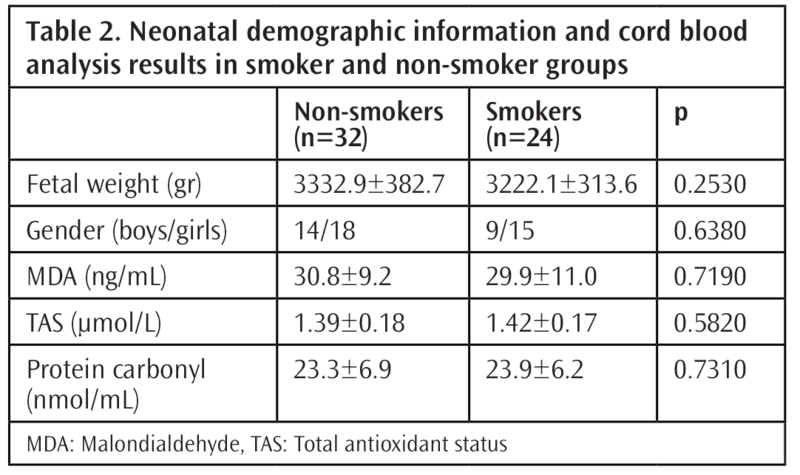 Fayol L, Gulian JM, Dalmasso C, Calaf R, Simeoni U, Millet V. Antioxidant status of neonates exposed in utero to tobacco smoke. Biol Neonate 2005;87:121-6. Gülbahar Ö. Protein oksidasyonunun mekanizması, önemi ve yaşlılıkla ilişkisi. Turk Geriatri Derg 2007;10:43-8. Kayalı R, Çakatay U. Protein oksidasyonunun ana mekanizmaları. Cerrahpaşa Tıp Derg 2004;35:83-9. Halliwell B. Antioxidant characterization. Methodology and mechanism. Biochem Pharmacol 1995;49:1341-8. Dixon CB, Robertson RJ, Goss FL, Timmer JM, Nagle EF, Evans RW. The effect of acute resistance exercise on serum malondialdehyde in resistance-trained and untrained collegiate men. J Strength Cond Res 2006;20:693-8. Jenkins RR. Exercise and oxidative stres methodology: A critique. Am J Clin Nutr 2000;72:670-4.